Imam Hassan Ibn Ali (Arabic: الحسن بن علي بن أبي طالب‎) born March 4, 625 CE (Ramadan 15th, 3 AH) – martyred March 9, 670 CE (Safar 7th, 50 AH) is an important figure in Islam. He is the son of Imam Ali (PBUH) and Lady Fatimah (PBUH). After his father’s martyrdom, he briefly succeeded him as Imam, the Caliph and leader of Muslims (before the Prophet’s martyrdom, Gad had determined 12 Successor of the prophet as Imam and leader) . Imam Hassan (PBUH) is 2nd Imam of Shia Muslims. Imam Hassan is also highly respected by the Sunni as the grandson of Prophet Muhammad (PBUH). 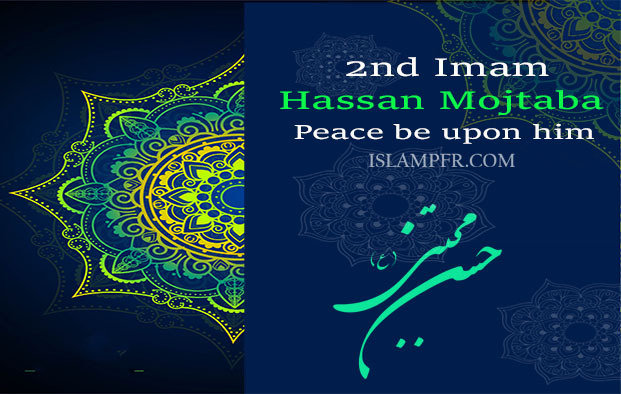 Imam Hassan (PBUH) was born in 625 A.D (15 Ramazan 3 A.H). According to Shia and Sunni sources, the Prophet (PBUH), upon the birth of his first grandson, was ordered by the archangel Gabriel to name him Hassan – a name not used in the pre-Islamic period. Prophet Muhammad (PBUH) also honored his grandson by reciting the Adhan & Iqāmah (the Islamic call to worship God, it contains testimony) in his ears, shaving his head, and sacrificing a ram for the sake of his birth. He grew up in a unique family, his mother was the best woman in the world and his father was the greatest man after the prophet Muhammad (PBUH), so he was taught best morals. As a growing youth, Imam Hassan (PBUH) saw his father on the battlefield defending Islam as well as preaching to a vast congregation of believers on the occasion of hajj and as a missionary of Islam to Yemen before retreating to a passive role in the matters of the state during the period of the first three caliphs after the demise of his grandfather, Prophet Muhammad (PBUH). There are also Hadith that state that Hassan (PBUH) and Hussain (PBUH) are the Masters of the youth in paradise and Hassan (PBUH) and his brother Hussain (PBUH) are Imams “whether they sit or stand”. Imam Hassan (PBUH) is one of five persons included in the Hadith of the Cloak. He is said to have been the first of the Prophet’s family to enter Yemeni Kisa after Prophet Muhammad and to have walked hand in hand with the Prophet as a child to testify to the truth of Islam at Mubahila. Imam Hassan (PBUH) was one of the guards defending Othman Ibn Affan (third caliph) when the attackers were going to kill Othman. He also was injured. When the third caliph was murdered by protesters in his palace, finally people understood no one couldn’t be better than Imam Ali (PBUH) to lead them, thus, Imam Ali was elected to lead the Muslims. Hassan (PBUH) assisted his father: When Abu Musa al-Ash’ari, the governor of Kufa, did not cooperate with Imam Ali (PBUH)’s delegation in order to stand against those who waged the Battle of Jamal, Imam Ali (PBUH) sent Ammar Ibn Yasir and Hassan (PBUH) with a letter to Kufa. Imam Hasan (PBUH) delivered a sermon in the Mosque of Kufa and managed to convince about 10,000 people to join and stand against the army of Nakithin (oath- breakers). Then participated actively in the battles of Basra, Siffin and Nahrawan alongside his father, demonstrating skill both as a soldier and a leader. Upon the martyrdom of Imam Ali (PBUH) in Kufa a new caliph had to be elected. According to Imam Ali’s appointment before his martyrdom the Imamate transfered to Imam Hassan (PBUH). So Kufi Muslims gave their allegiance to Imam Hassan (PBUH) without dispute. however, Muawiyah ibn Abi Sufyan, who had a long-running dispute with Imam Ali (PBUH), and always have been against the truth and verity not only didn’t give allegiance to Imam Hassan (PBUH), but summoned the commanders of his forces in Syria, Palestine, and Transjordan to join him in preparation for battle against Imam Hassan. There was no choice, thus the Imam gathered his army to defend. Near the battlefield, Muawiyah sent some men through the army of Muslims and they rumored Imam Hassan (PBUH) wants to give up the battle. Although, Imam Hassan (PBUH) wanted the army to follow his orders even if they did not agree with them, but some of the troops rebelled and attacked him through persuading by Muawiyah’s men. Imam Hassan (PBUH) was wounded but loyal soldiers surrounded him and managed to kill the mutineers. On the other hand, since Muawiyah was so miscreant, offered large sums of money and promises of vast properties and governorship of provinces to commanders of Imam Hassan’s army. Those commanders, who hadn’t deep faith, fooled by properties and not only they left the Imam but also they took their army and just some companions of Imam stayed beside him. Muawiya sent two Quraysh men from the tribe of ‘Abd-i-Shams called ‘Abdu Rahman bin Sumura and Abdullah bin ‘Amir Bin Kuraiz to Imam Hassan “Go to this man (i.e. Imam Hassan (PBUH) ) and negotiate peace with him and talk and appeal to him.” So, they went to Imam Hassan and talked and appealed to him to accept peace. Imam Hassan (PBUH) said, “We, the offspring of ‘Abdul Muttalib, have got wealth and people have indulged in killing and corruption (and money only will appease them).” They said to Imam Hassan, “Muawiya offers you so and so, and appeals to you and entreats you to accept peace.” Imam Hassan (PBUH) said to them, “But who will be responsible for what you have said?” They said, “We will be responsible for it.” So, what-ever Imam Hassan asked they said, “We will be responsible for it for you.” So, Imam Hassan (PBUH) concluded a peace treaty with Muawiya but under some conditions. Shia scholars quote Hadith from later Shia Imams to the effect that Imam Hassan lacked the support to fight and win, so he ceded power to Muawiya. Muawiyah did not comply with the terms of the treaty, saying to the people of Kufa, “do you think I have taken power to teach you? No, I have taken power and if any one of you tries to disagree with me he shall pay the costly price of the loss of his head.” He carried out his ambition of keeping the power in his family by nominating his son Yazid as caliph after him. Imam Hassan (PBUH) said Muawiyah is not permitted to state Caliph after himself and Caliphate belongs to Imam Hassan. However after awhile Muawiyah stated Yazid as next Caliph by forcing, treating and killing people. Imam Hassan (PBUH) said Muawiyah ought not to insult or dishonor Imam Ali (pbuh). But Muawiyah in his first travel to Medina ordered to insult Imam Ali (pbuh) after each prayer and made it a tradition among Muslims. Imam Hassan (PBUH) wants Muawiyah to respect to the Shia (Muslim followers of Imams) rights and leave them in peace and safety. but Muawiyah did against this terms. As it was expected, Muawiyah ordered to kill Shia Muslims wherever they were found, even if two people testify someone is Shia, that person should be killed. Also he ordered to kill every baby or child who was named Ali. Imam Hassan (PBUH) returned to Medina. He lacked his moral support and had a hard time during his stay there after the peace treaty, with taunts and abuse from some of Muawiyah’s followers and the anger of his supporters for having relinquished the caliphate. He donated all his belongings completely twice in his lifetime. Also, he divided his property between himself and the poor people equally three times. He was famous in modesty, generosity, munificence, science and knowledge, bravery and many positive moral points. Imam Hassan (PBUH) martyred in Medina in 670 A.D (7 Safar 50 A.H). He is buried at the famous Jannat Al-Baqee cemetery across from the Masjid al-Nabi (Mosque of the Prophet). 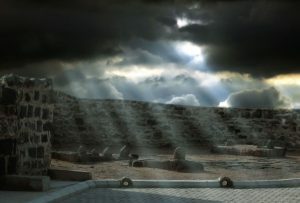 According to historians, Muawiyah wished to pass the caliphate to his own son Yazid, and saw Imam Hassan as an obstacle. According to the Shia and Sunni sources he secretly contacted Imam Hassan’s wife, Ja’da bint al-Ash’ath Ibn Qays, and incited her to poison her husband. Ja’da did as Muawiyah suggest, giving her husband poison mixed with honey when he came back home for Iftar(Muslims Iftar to finish fast). Ja’da was promised gold and marriage to caliph Yazid. Seduced by the promise of wealth and power, she poisoned her husband, and then hastened to the court of Muawiyah in Damascus to receive her reward. Muawiyah reneged on his promises. It is said that Ja’da lost his mind because of killing an Imam and also being rejected by Muawiyah. وفي تاريخ الطبري أن الحسن بن علي رضي الله عنهما مات مسموما في أيام معاوية وكان عند معاوية كما قيل دهاء فدس إلى جعدة بنت الأشعث بن قيس وكانت زوجة الحسن رضي الله عنه شربة وقال لها إن قتلت الحسن زوجتك بيزيد. فلما توفي الحسن بعثت إلى معاوية تطلب قوله فقال لها في الجواب أنا أضن بيزيد. “It is written in Tarikh Al-Tabari that Hassan ibn Ali (PBUH) was poisoned in Muawieh era. Muawieh who was clever sent syrup to Ja’da bint al-Ash’ath, Imam Hassan’s wife, secretly and told her if you kill Hassan (PBUH), I will take you to marry with Yazid. However, unfortunately, this narration does not exist in new prints of the book Tarikh Al-Tabari and it is omitted from it by some depositaries. Imam Hassan (PBUH) had asked for his body to be taken to the prophet’s grave, so that he could pay his last respect. This caused armed opposition. As the funeral proceeded towards the grave of Prophet Muhammad some Umayyad mounted on horses obstructed it. Aisha bint Abu Bakr (one of the Prophet’s wives) appeared, riding a mule and shouting that the grave of Muhammad (PBUH) was in her house and she would not allow the grandson of Khadijah (the first wife of the Prophet and mother of Lady Fatimah) to be buried beside the Prophet. Then a shower of arrows fell on the coffin. Marwan was the governor of Medina at the time and objected on the grounds that Othman (third caliph) had not been allowed to be buried. After Imam Hassan’s martyrdom his Iraqi followers wrote to Imam Hussain (PBUH) pledging allegiance and proposing to remove Muawiya. because they were informed about Imams by the prophet’s narrations. The shrine containing Imam Hassan’s tomb was destroyed in 1925 during the conquest of Medina by Al-Saud tribes (Wahhabi). This was part of a general destruction of memorials in cemeteries for beliefs. In the eyes of Wahhabis, historical sites and shrines encourage “shirk” (the sin of idolatry or polytheism) and should be destroyed but it’s against Islam’s view. it’s provable that keeping these memorials and pilgrimage isn’t Shirk. Imam Hassan Mojtaba (PBUH) in Baqi cemetery. Wahhabi government of Saudi Arabia, don’t let the pilgrims to get close to the graves. They even don’t let Shia people make a Shrine there.